First written in 1935, Shriner remains a classic text in the field. Coauthor Christine Hermann has introduced modern methods and topics and completely updated the illustration and photo program. The book is ideal for the Advanced Organic Lab and for Spectroscopy courses. 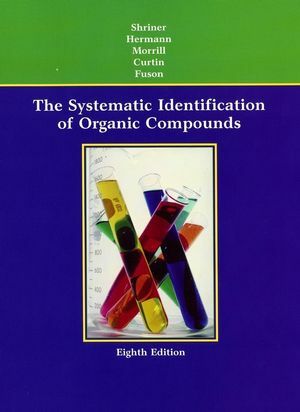 Ralph L. Shriner is the author of The Systematic Identification of Organic Compounds, 8th Edition, published by Wiley. Christine K. F. Hermann is the author of The Systematic Identification of Organic Compounds, 8th Edition, published by Wiley. Chapter 2. Identification of Unknowns. Chapter 3. Preliminary Examination, Physical Properties, and Elemental Analysis. Chapter 4. Separation of Mixtures. Chapter 5. Classification of Organic Compounds by Solubility. Chapter 6. Nuclear Magnetic Resonance Spectrometry. Chapter 9. Chemical Tests for Functional Groups. Chapter 10. The Preparation of Derivatives. Chapter 11. Structural Problems—Solution Methods and Exercises. Appendix I. Handy Tables for the Organic Laboratory. Appendix II. Tables of Derivatives. Appendix III. Equipment and Chemicals for the Laboratory.